Jon Corzine – the next Bernie Madoff? 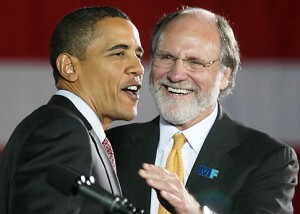 Jon Corzine (right) - the next Bernie Madoff? How many Bernie Madoff’s are there still at large? How many leaders of investment firms are nothing more than gamblers? Jon Corzine bet $6 billion on Europe, while Greece is double-crossing the Eurozone’s bailout plan. Brilliant! Corzine’s firm, appropriately named MF Global, was worth only a fraction of Corzine’s $6 billion gamble and made the “investment” with borrowed (other people’s money). In addition, regulators said Corzine failed to protect his customers’ money by illegally mingling it with his MF Global’s money. $700 million worth of Corzine’s customers’ money is apparently gone! The company’s main exchange regulator, CME, said Tuesday “CME has determined MF Global is not in compliance with Commodity Futures Trading Commission and CME customer segregation requirements,” CME Group Inc Chief Executive Craig Donohue said. Futures brokers must keep customer accounts separate from each other and from the firm’s own money. Now, MF Global has filed for bankruptcy. Corzine, 64, who once ran Goldman Sachs before becoming a U.S. senator and then governor of New Jersey, had been trying to turn the more than 200-year-old MF Global into a mini Goldman by taking on more risky trades. However, once regulators forced it to fully disclose the bets on debt issued by countries including Italy, Portugal and Spain, it rapidly unraveled with no buyers willing to step in. This has affected the U.S. stock market, which is plunging, along with a lot of Main Street 401Ks and retirement funds. Is Corzine, like so many others, too big to prosecute? The Government Accountability Institute (GAI) finds that President Barack Obama’s and Attorney General Eric Holder’s failure to criminally charge any top Wall Street bankers is likely a result of cronyism inside the Department of Justice and political donations made to Obama’s campaign. The Obama administration’s decision to not appoint an independent counsel to investigate Jon Corzine’s MF Global scandal, despite more than 60 members of Congress demanding it, also reeks of cronyism, the GAI report details. The crooks in government and the crooks in Wall Street march on together, while the rest of the country sinks deeper into depression. The United States government is a broken institution. 6 comments to Jon Corzine – the next Bernie Madoff? John, thanks for this clarification on Corzine! I read yr blog, it’s short n easy for me to get what’s happening. Other writers get so caught up with their own writings, that I have to wade thru tons of words to understand what the hell they are writing. Taking a lot of my limited reading time! What Jon Corzine did is illegal, and I hope that he will go to prison for what he did to his clients’ funds! He is a “Bernie Madoff”. With all the “Occupy Wall Street’ protests going on, maybe Goldman Sach’s Lloyd Bankfein is thinking he can wrap all these protests together, n sell them as bonds??? What the rich so- called “bankers”‘are doing to investors is illegal, we are being ‘skinned alive’and many don’t even know it! he would have continued what he was doing, had it not been for the Greek crisis, using his client’s $$$. Is this how these ‘bankers’ are doing with our funds these days? They live out their grand lives in the hamptons, holidays to Monte Caro, summers in Florida…and their clients eventually go bust, while the bankers have their commisions, huge bonuses, n not lose a dime! John, thanks for this post! where can I go to become a Wall Street banker? John, most ordinary people would not comprehend what these ‘bankers’ are doing. And i think, even the writers of other blogs. Thanks for explaining to me, how all this works! Most creative games they play, shuffling around OTHER people’s money, in the BILLIONS. I think, because of your BLOG, the FBI is now investigating Corzine. Ian: Thanks. A lot of writers have to pile in enough words to fill a quota. Fortunately, I can be brief, and hopefully communicate what others lose in their wordiness.